The Juno spacecraft will, for the first time, see below Jupiter's dense cover of clouds. This is why the mission was named after the Roman goddess, who was Jupiter's wife, and who could also see through clouds. Juno's primary goal is to reveal the story of the formation and evolution of the planet Jupiter. Using long-proven technologies on a spinning spacecraft placed in an elliptical polar orbit, Juno will observe Jupiter's gravity and magnetic fields, atmospheric dynamics and composition, and the coupling between the interior, atmosphere and magnetosphere that determines the planet's properties and drives its evolution. An understanding of the origin and evolution of Jupiter, as the archetype of giant planets, can provide the knowledge needed to help us understand the origin of our solar system and planetary systems around other stars. How much water or oxygen is in Jupiter? What is the structure inside Jupiter? Does Jupiter rotate as a solid body, or is the rotating interior made up of concentric cylinders? Is there a solid core, and if so, how large is it? How is its vast magnetic field generated? How are atmospheric features related to the movement of the deep interior? What are the physical processes that power the auroras? What do the poles look like? 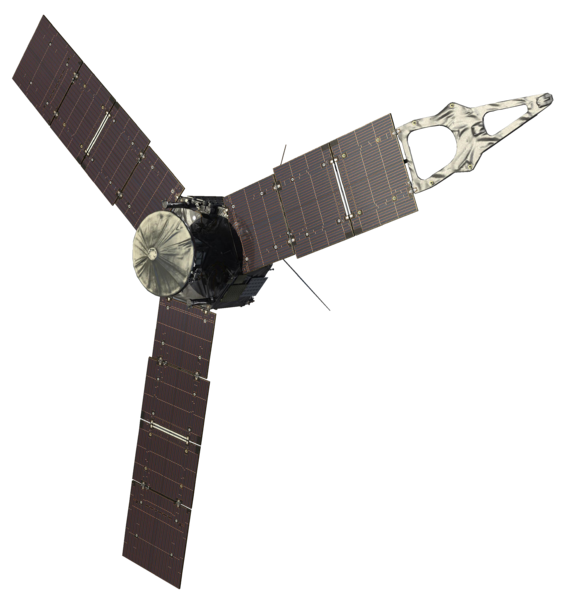 Juno uses a spinning, solar-powered spacecraft in a highly elliptical polar orbit that avoids most of Jupiter's high-radiation regions. The designs of the individual instruments are straightforward and the mission did not require the development of any new technologies. For Juno, like NASA's earlier Pioneer spacecraft, spinning makes the spacecraft's pointing extremely stable and easy to control. Just after launch, and before its solar arrays are deployed, Juno will be spun-up by rocket motors on its still-attached second-stage rocket booster. Juno's planned spin rate varies during the mission: 1 RPM for cruise, 2 RPM for science operations and 5 RPM for main engine maneuvers. To simplify and decrease weight, all instruments are fixed. While in orbit at Jupiter, the spinning spacecraft will sweep the fields of view of its instruments through space once for each rotation. At two rotations per minute, the instruments' fields of view sweep across Jupiter about 400 times in the two hours it takes Juno to fly from pole to pole. The spacecraft's main body measures 11.5 feet (3.5 meters) tall and 11.5 feet (3.5 meters) in diameter. The spacecraft's hexagonal two-deck structure uses composite panel and clip construction for decks, central cylinder and gusset panels. Polar mounted off-center spherical tanks provide spinning spacecraft designs with high stability. For weight savings and redundancy, Juno uses a dual mode propulsion subsystem, with a bi-propellant main engine and mono-propellant reaction control system thrusters. The Leros-1b main engine is a 645-Newton bi-propellant thruster using hydrazine-nitrogen tetroxide. Its engine bell is enclosed in a micrometeoroid shield that opens for engine burns. The engine is fixed to the spacecraft body firing aft and is used for major maneuvers and flushing burns. The 12 reaction control system thrusters are mounted on four rocket engine modules. They allow translation and rotation about three axes. They are also used for most trajectory correction maneuvers. Command and data handling includes a RAD750 flight processor with 256 megabytes of flash memory and 128 megabytes of DRAM local memory. It provides 100 Mbps total instrument throughput, more than enough for payload requirements. To protect sensitive spacecraft electronics, Juno will carry the first-of-its-kind radiation shielded electronics vault, a critical feature for enabling sustained exploration in such a heavy radiation environment. Each of the titanium cube's six sides measures nearly a square meter (nearly 9 square feet) in area, about a third of an inch (1 centimeter) in thickness, and 40 pounds (18 kilograms) in mass. This titanium box - about the size of an SUV's trunk - encloses Juno's command and data handling box (the spacecraft's brain), power and data distribution unit (its heart) and about 20 other electronic assemblies. The whole vault weighs about 500 pounds (200 kilograms). Juno's Electrical Power Subsystem manages the spacecraft power bus and distribution of power to payloads, propulsion, heaters and avionics. The power distribution and drive unit monitors and manages the spacecraft power bus, manages the available solar array power to meet the spacecraft load and battery state of charge, and provides controlled power distribution. Power generation is provided by three solar arrays consisting of 11 solar panels and one MAG boom. Two 55 amp-hour lithium-ion batteries provide power when Juno is off-sun or in eclipse, and are tolerant of the Jupiter radiation environment. The power modes during science orbits are sized for either data collection during an orbit emphasizing microwave radiometry or gravity science. Jupiter's orbit is five times farther from the sun than Earth's, so the giant planet receives 25 times less sunlight than Earth. Juno will be the first solar-powered spacecraft designed to operate at such a great distance from the sun, thus the surface area of solar panels required to generate adequate power is quite large. Juno benefits from advances in solar cell design with modern cells that are 50 percent more efficient and radiation-tolerant than silicon cells available for space missions 20 years ago. The mission's power needs are modest. Juno has energy-efficient science instruments. Solar power is possible on Juno due to the energyefficient instruments and spacecraft, a mission design that can avoid Jupiter's shadow and a polar orbit that minimizes the total radiation. The spacecraft's three solar panels extend outward from Juno's hexagonal body, giving the overall spacecraft a span of more than 66 feet (20 meters). The solar panels will remain in sunlight continuously from launch through end of mission, except for a few minutes during the Earth flyby. Before deployment in space, the solar panels are folded into four-hinged segments so the spacecraft can fit into the launch vehicle's payload fairing. Juno's thermal control subsystem uses a passive design with heaters and louvers. The main component of the thermal control subsystem consists of an insulated, louvered electronics vault atop an insulated, heated propulsion module. This design accommodates all mission thermal environments from Earth orbit to Jupiter orbital operations. During cruise, while the spacecraft is close to the sun, the high-gain antenna is used as a heat shield to protect the vault avionics. Most instrument electronics are contained within the radiation vault and are thermally managed as part of the vault thermal control system. Science sensors are externally mounted to the deck and are individually blanketed and heated to maintain individual temperature limits. The Juno spacecraft carries a payload of 29 sensors, which feed data to nine onboard instruments. Eight of these instruments (MAG, MWR, Gravity Science, Waves, JEDI, JADE, UVS, JIRAM) are considered the science payload. One instrument, JunoCam, is aboard to generate images for education and public outreach. Primary science observations are obtained within three hours of closest approach to Jupiter, although calibrations, occasional remote sensing and magnetospheric science observations are planned throughout the science orbits around Jupiter. Juno is spin-stabilized. Because of the spacecraft mission design and the fact that its science instruments were all developed together, and there is no need for a scan platform to point instruments in different directions. Gravity science and microwave sounding of the atmosphere observations are obtained through orientation of the spacecraft's spin plane. All other experiments utilize ride-along pointing and work in either one or both orientations. This design allows for very simple operations. The Gravity Science experiment will enable Juno to measure Jupiter's gravitational field and reveal the planet's internal structure. Two transponders operating on different frequencies (Ka- and X-band) will detect signals sent from NASA's Deep Space Network on Earth and immediately send signals in return. Small changes in the signal's frequencies (as they are received on Earth) provide data on how much Juno's velocity has been modified due to local variations in Jupiter's gravity. These subtle shifts in Juno's velocity reveal the gas giant's gravity (and how the planet is arranged on the inside), and provide insight into the gas giant's internal structure. Agenzia Spaziale Italiana in Rome, Italy contributed the Ka-band translator system. Juno's Magnetometer creates a detailed three-dimensional map of Jupiter's magnetic field. Juno's Magnetometer instrument is a flux gate type magnetometer, which measures the strength and direction of Jupiter's magnetic field lines. An Advanced Stellar Compass images stars to provide information on the exact orientation of the magnetometer sensors. This enables Juno's very precise magnetic field measurement. Magnetometer sensors are mounted on the magnetometer boom at the end of one of Juno's three solar arrays - as far away from the spacecraft body as possible. This was done to avoid the instruments from confusing the spacecraft magnetic field with Jupiter's. The boom is designed to mimic the outermost solar array panel (of the remaining two solar array structures) in mass and mechanical deployment. The spacecraft magnetic field is further separated from Jupiter's field by the use of two magnetometer sensors - one 33 feet (10 meters) from the center of the spacecraft and one 39 feet (12 meters) from the center. By comparing measurements from both sensors, scientists can isolate the magnetic field of Juno from Jupiter. The Flux Gate Magnetometer was designed and built by NASA's Goddard Space Flight Center Greenbelt, Md., and the Advanced Stellar Compass was designed and built by the Danish Technical University in Lyngby, Denmark. Juno's Microwave Radiometer instrument will probe beneath Jupiter's cloud tops to provide data on the structure, movement and chemical composition to a depth as great as 1,000 atmospheres -- about 342 miles (550 kilometers) below the visible cloud tops. The Microwave Radiometer consists of six radiometers designed to measure the microwaves coming from six cloud levels. Each of the six radiometers has an antenna extending from Juno's hexagonal body. Each antenna is connected by a cable to a receiver, which sits in the instrument vault on top of the spacecraft. NASA's Jet Propulsion Laboratory in Pasadena, Calif. provided the Microwave Radiometer subsystem components, including the antennas and receivers. The Jupiter Energetic Particle Detector Instrument will measure the energetic particles that stream through space and study how they interact with Jupiter's magnetic field. JEDI comprises three identical sensor units each with 6 ion and 6 electron views. The instrument works in coordination with the JADE and Waves instruments to investigate Jupiter's polar space environment, with a particular focus on the physics of Jupiter's intense and impressive northern and southern auroral lights. The instrument was designed and built by the Johns Hopkins University's Applied Physics Laboratory, Laurel, Md. The Jovian Auroral Distributions Experiment will work with some of Juno's other instruments to identify the particles and processes that produce Jupiter's stunning auroras. The Jovian Auroral Distributions Experiment consists of an electronics box shared by four sensors: three will detect the electrons that surround the spacecraft ,and the fourth will identify positively charged hydrogen, helium, oxygen and sulfur ions. When Juno flies directly over auroras, the instrument will be able to characterize the particles that are coming down Jupiter's magnetic field lines and crashing into Jupiter's atmosphere. The Jovian Auroral Distributions Experiment was designed and built by the Southwest Research Institute in San Antonio. The Waves instrument will measure radio and plasma waves in Jupiter's magnetosphere, helping us understand the interactions between the magnetic field, the atmosphere and the magnetosphere. The Waves instrument consists of a V-shaped antenna that is about 13 feet (four meters) from tip to tip, similar to the rabbit-ear antennas that were once common on TVs. One of the ears of the Waves instrument detects the electric component of radio and plasma waves, while the other is sensitive to the magnetic component. The magnetic antenna - called a magnetic search coil - consists of a coil of fine wire wrapped 10,000 times around a 5.9-inch (15-centimeter) long core. The search coil measures magnetic fluctuations in the audio frequency range. The Waves instrument was designed and built by the University of Iowa in Iowa City. The Ultraviolet Imaging Spectrograph will take pictures of Jupiter's auroras in ultraviolet light. Working with Juno's JADE and JEDI instruments, which measure the particles that create the auroras, UVS will help us understand the relationship between the auroras, the streaming particles that create them and the magnetosphere as a whole. The Ultraviolet Imaging Spectrograph instrument was designed and built by Southwest Research Institute in San Antonio. The Jovian Infrared Auroral Mapper will study Jupiter's atmosphere in and around the auroras, helping us learn more about the interactions between the auroras, the magnetic field and the magnetosphere. JIRAM will be able to probe the atmosphere down to 30 to 45 miles (50 to 70 kilometers) below the cloud tops, where the pressure is five to seven times greater than on Earth at sea level. The Jovian Infrared Auroral Mapper instrument consists of a camera and a spectrometer, which splits light into its component wavelengths, like a prism. The camera will take pictures in infrared light, which is heat radiation, with wavelengths of two to five microns (millionths of a meter) - three to seven times longer than visible wavelengths. The Jovian Infrared Auroral Mapper instrument was designed and built by the Italian National Institute for Astrophysics, Milano, Italy, and funded by the Agenzia Spaziale Italiana in Rome. JunoCam will capture color pictures of Jupiter's cloud tops in visible light. JunoCam will provide a wide-angle view of Jupiter's atmosphere and poles. JunoCam is designed as an outreach full-color camera to engage the public. The public will be involved in developing the images from raw data and even helping to design which areas of Jupiter should be imaged. The JunoCam camera head has a lens with a 58-degree cross-scan field of view. It acquires images by sweeping out that field while the spacecraft spins to cover an along-scan field of view of 360 degrees. Lines containing dark sky are subsequently compressed to an insignificant data volume. It takes images mainly when Juno is very close to Jupiter, with a maximum resolution of up to 1 to 2 miles (2 to 3 kilometers) per pixel. The wide-angle camera will provide new views of Jupiter's atmosphere. JunoCam's hardware is based on a descent camera that was developed for NASA's Mars Science Laboratory rover. Some of its software was originally developed for NASA's Mars Odyssey and Mars Reconnaissance Orbiter spacecraft. JunoCam is provided by Malin Space Science Systems, San Diego, Calif. The principal goal of NASA's Juno mission is to understand the origin and evolution of Jupiter. Underneath its dense cloud cover, Jupiter safeguards secrets to the fundamental processes and conditions that governed our solar system during its formation. As our primary example of a giant planet, Jupiter can also provide critical knowledge for understanding the planetary systems being discovered around other stars. With its suite of science instruments, Juno will investigate the existence of a possible solid planetary core, map Jupiter's intense magnetic field, measure the amount of water and ammonia in the deep atmosphere, and observe the planet's auroras. Theories about solar system formation all begin with the collapse of a giant cloud of gas and dust, or nebula, most of which formed the infant sun, our star. Like the sun, Jupiter is mostly hydrogen and helium, so it must have formed early, capturing most of the material left after our star came to be. How this happened, however, is unclear. Did a massive planetary core form first and capture all that gas gravitationally, or did an unstable region collapse inside the nebula, triggering the planet's formation? Differences between these scenarios are profound. Even more importantly, the composition and role of icy planetesimals, or small protoplanets, in planetary formation hangs in the balance - and with them, the origin of Earth and other terrestrial planets. Icy planetesimals likely were the carriers of materials like water and carbon compounds that are the fundamental building blocks of life. Unlike Earth, Jupiter's giant mass allowed it to hold onto its original composition, providing us with a way of tracing our solar system's history. Juno will measure the amount of water and ammonia in Jupiter's atmosphere and help determine if the planet has a core of heavy elements, constraining models on the origin of this giant planet and thereby the solar system. By mapping Jupiter's gravitational and magnetic fields, Juno will reveal the planet's interior structure and measure the mass of the core. How deep Jupiter's colorful zones, belts and other features penetrate is one of the most outstanding fundamental questions about the giant planet. Juno will determine the global structure and motions of the planet's atmosphere below the cloud tops for the first time, mapping variations in the atmosphere's composition, temperature, clouds and patterns of movement down to unprecedented depths. Deep in Jupiter's atmosphere, under great pressure, hydrogen gas is squeezed into a fluid known as metallic hydrogen. At these enormous pressures, the hydrogen acts like an electrically conducting metal, which is believed to be the source of the planet's intense magnetic field. This powerful magnetic environment creates the brightest auroras in our solar system, as charged particles precipitate down into the planet's atmosphere. Juno will directly sample the charged particles and magnetic fields near Jupiter's poles for the first time, while simultaneously observing the auroras in ultraviolet light produced by the extraordinary amounts of energy crashing into the polar regions. These investigations will greatly improve our understanding of this remarkable phenomenon, and also of similar magnetic objects, like young stars with their own planetary systems. understanding of the solar system by understanding the origin and evolution of Jupiter. It addresses science objectives central to three NASA Science divisions: Solar System (Planetary), Earth-Sun System (Heliophysics), and Universe (Astrophysics). Juno's primary science goal of understanding the formation, evolution, and structure of Jupiter is directly related to the conditions in the early solar system, which led to the formation of our planetary system. The mass of Jupiter's possible solid core and the abundance of heavy elements in the atmosphere discriminate among models for giant planet formation. Juno constrains the core mass by mapping the gravitational field, and measures through microwave sounding the global abundances of oxygen (water) and nitrogen (ammonia). Juno reveals the history of Jupiter by mapping the gravitational and magnetic fields with sufficient resolution to constrain Jupiter's interior structure, the source region of the magnetic field, and the nature of deep convection. By sounding deep into Jupiter's atmosphere, Juno determines to what depth the belts and zones penetrate. Juno provides the first survey and exploration of the three-dimensional structure of Jupiter's polar magnetosphere.